With tropical cruising becoming increasingly popular and accessible in the last 2-3 decades, trends have developed in outfitting yachts for ocean cruising. Some of these trends that originated from sailing in moderate settled weather areas have resulted in significantly increased risks when a vessel is caught in severe conditions. Many of today’s cruising yachts, whether of modern design or not, have become top-heavy through numerous “standard” additions ranging from stern arches, davits, dodgers, shade cloths, solar arrays, wind generators, dinghies on deck, antennas, radar scanners up in the rig, furling headsails and sometimes many more items such as jerrycans, kayaks, surfboards and outboard motors stored on deck when in fact they should really be stowed down-below – if on board at all. Click on the image to get the full resolution file and inspect it carefully. See the care placed into all the custom stainless steel fabrication: the radar scanner was gimballed to keep it horizontal with heel. Look at the amount of gear on deck and the number of gadgets populating the stern. Now bring in the reality of 45 knots of wind gusting 55 knots with 6-metre seas offshore and all this carefully designed convenience and practicality will fuel disaster. Liferafts stowed on the roof top are the first thing to get ripped off the deck in a knock-down. Kayaks in the lifelines cause considerable damage as they prevent water from leaving the deck freely; solar panels installed as shown get readily destroyed while taking some of the railing out. Look at the added windage compared to a stripped-down version of the same boat. While it is not readily apparent on the photo, there are two spinnaker poles stowed up in the air. Slow and heavy cruisers such as this struggle to point in high winds and rough seas. They tend to get attacked by the sea on the beam and can ship a lot of green water. While some awareness usually exists about the impact of weight on and above the deck in terms of reducing the stability range, the fact is often discounted until it becomes perceptibly dangerous – which is a long way down the track and far too late. However, the first consequence of outfitting as described above is windage and its effect is more insidious. Since many tropical cruisers predominantly opt for downwind routes, high windage mostly translates into additional drive and no major issues are experienced. Since heavy weather at sea is far from a common occurrence and simply doesn’t occur in Trade Wind areas outside the possible cyclone seasons, one could arguably cruise the tropics near indefinitely with minimal wisdom and without ever encountering truly severe conditions. In reality, most yachts engaged in Trade Wind cruising do stray from the easy latitudes to some extent at some point: rounding Cape of Good Hope, descending to New Zealand or sailing to or from their home port. Areas of strong ocean currents such as the Gulf Stream, the current descending the East Coast of Australia towards Bass Strait, the current of Brazil or the Aghulas Current off South Africa can all result in dangerous sea conditions at times if stronger winds are experienced. This is where incidents usually start being recorded. Aerodynamic drag forces acting on a yacht are oriented with the wind direction and increase with the square of the wind speed. This means that, in a 40-knot blow, the drag will be four times higher than in 20 knots of breeze; it will be 9 times higher in a 60-knot gust. This has detrimental consequences on sailing ability that can seriously compromise safety in bad weather. 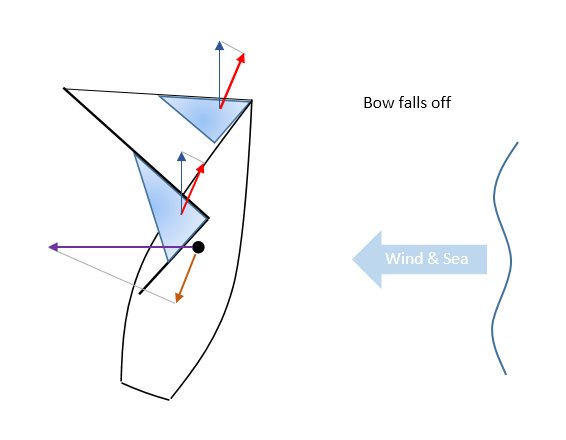 On a yacht sailing to weather, the aerodynamic drag force (purple) is aligned with the wind and sail lift forces (blue) are perpendicular to the wind direction. As long as the sum of the driving components (red) is greater than the total aerodynamic resistance (orange), some net propulsion remains available and the vessel will make headway. One must remember that both driving forces and drag increase as the wind speed gets higher. Reefing the sails lowers the centre of effort of the rig, allowing higher sail forces and more propulsive power for the same heel angle. On the other hand, the bare upper section of the mast now only contributes to drag. 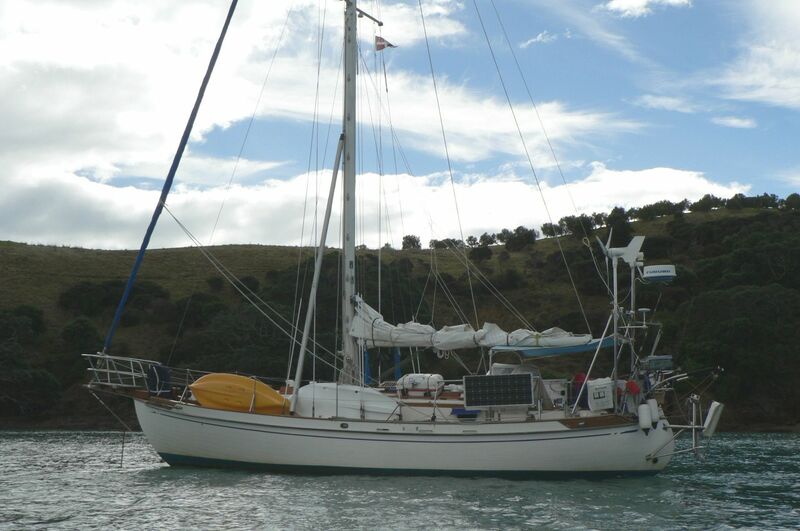 Still, a well configured yacht should have no trouble sailing upwind in storm conditions. Increasing aerodynamic drag (purple) through the addition of equipment above the deck results in a greater resistance component as well; this resistance component (orange) can cancel the driving forces (red). At this point, the boat is unable to develop any speed and can’t progress at the given wind angle. As the bow falls off, a new point of equilibrium is attained. A greater fraction of the lift forces is converted into drive and aerodynamic drag acts more as a side force than a brake. The difference now is that the vessel is travelling at an angle much more parallel to the sea and is unable to do better. Since all propulsion originates from aerodynamic lift forces, the net effect of adding aerodynamic drag to a sailing yacht is deteriorating the lift/drag ratio. As highlighted above, the yacht naturally compensates by falling off the wind because this increases drive and reduces the forward resistance component. It falls off the wind until a new equilibrium point is found. As a result, added drag always reduces the upwind ability of a yacht. Incidentally, hydrodynamic hull drag has the same effect on pointing ability in the sense that it adds to the resistance component and also needs to be overcome by propulsive forces. Large wetted surface, poorly designed appendages, protruding hull fittings and transducers all lead to poor tacking angles. Increasing displacement also tends to opens up the tacking angle, because hull resistance is proportional to displacement. If conditions become severe enough to cause the sea to break, inability to point to weather can result in a very dangerous near beam hit. Since windage also results in additional heeling moment and is often coupled with weight aloft, the available stability margin is reduced just as the likelihood of broadside impact is greatly increased. What started as a dodger, a stern arch and other structures aimed at improving convenience has now turned into a significant hazard. Heavy, old-fashioned long-keeled boats get into this situation quite quickly, often long before the wind truly reaches gale proportions, hence the old rants about heavy weather tactics and the various ways of lying in the sea. Those are not only inept, but very hazardous on board modern vessels with considerably more exposed hull area and much less inertia. If the wind is blowing onto a lee shore, once leeway is taken into account, the course on the ground may not even be better than 90° from the wind: the vessel becomes unable to gain to weather and may get driven ashore. When running downwind is ruled out either by the proximity of land or the behaviour of the vessel in following seas, a yacht with excessive windage and/or hull resistance quickly runs out of safe options by also being unable to point into the weather. It is a very unfortunate situation, because this is avoidable through sensible choices and sailing at moderate speed to weather under reduced canvas is often the simplest and safest way of handling a blow with heavy seas that could otherwise cause a knock-down with damage and potential injuries. In the figures above, all aerodynamic drag components were lumped together into one single drag force. This included the windage of the entire vessel as well as rig and sail drag. Adopting an efficient rig is the beginning. From this point of view, modern Bermudian sloop rigs still offer the best results in terms of practicality, simplicity, strength and upwind aerodynamic efficiency. Traditional, low aspect ratio rigs can offer more power off the wind than a Bermudian sloop rig, but they are very unfavourable upwind. In itself, it should be a good reason for discarding them because they don’t allow pointing properly in high winds and this leads to a dangerous situation once the sea can break. It has nothing to do with racing. Ketch, schooner and yawl rigs all lead to much greater aerodynamic drag due the second mast and set of shrouds. In most instances, they make no sense today unless the vessel is so large that splitting the sail area becomes somewhat desirable for handling, cost or sail manufacturing reasons. One should therefore refrain from destroying the efficiency of the rig through a proliferation of undesirable attachments. Radar scanners should be installed on a post at the stern, rather than up the mast. Achieving range through scanner elevation is not a relevant consideration anyway. Protruding mast steps and ladder rungs installed in the lower shrouds are all bad ideas. Multiple headsail furlers are disastrous upwind, especially on small to mid-size vessels. The list is rather long. Beyond this, consider the projected area of the yacht when viewing it from 45° from the bow and heeled 30°. Most of the profiling done seems based on a perfect head wind on an upright boat. This is not the way the wind blows at sea in a gale. Solar panels installed horizontally high up on arches don’t look so good when viewed from where the wind really comes from. Lower them down so they partly or completely disappear from view when the boat heels over. The local wind velocity is also much reduced at a lower elevation due to the vertical gradient and drag increases with the square of this velocity. Ideally, from an aerodynamic point of view, one would want a perfectly clean-looking vessel, like a racing yacht. 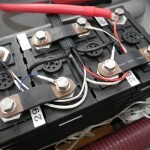 Practically, there is a need for generating some electricity and usually a desire for a degree of convenience that opposes the most efficient configuration. What can be tolerated is a question that needs answered case-by-case. Yachts with low resistance hulls and efficient keels don’t require as much driving force to keep progressing upwind and can often tolerate more windage than designs that already struggle to point properly in a minimal configuration. Windage can also be reduced significantly by removing offending features prior to undertaking any passage where heavy weather cannot be excluded, rather than “risking it”. This can include wind generators, dodgers and many more items that all contribute to increasing projected area. For some existing vessels normally confined to the Tropics, it may be the most practical option. This is also a lot of gear that won’t be able to carry away and cause damage if solid green water sweeps the deck. Some of the strongest headwinds experienced at sea and away from land on the sloop Yarra were in the area of the gulf of Peñas in Chili. The wind was such that the deep-reefed main had to be handed in, leaving a single storm jib forward. In order to take the mainsail in, I had to progress sitting in the windward side deck, my back to the wind all the way. Standing up was out of the question. Once I reached the mast, I mostly leaned against it while working to resist the pressure from the wind. Under storm jib alone, the sloop was climbing upwind at 4.5-5 knots heeled hard, well-balanced, and the turret of the steering vane was exactly at 45°, i.e. we were sailing at that angle from the wind, true wind and apparent wind being very near the same in those conditions. This ability to claw off any shore and punch into virtually any wind conditions encountered was one enormous safety factor for ocean cruising in this relatively small vessel, a safety factor many larger yachts were sorely lacking. 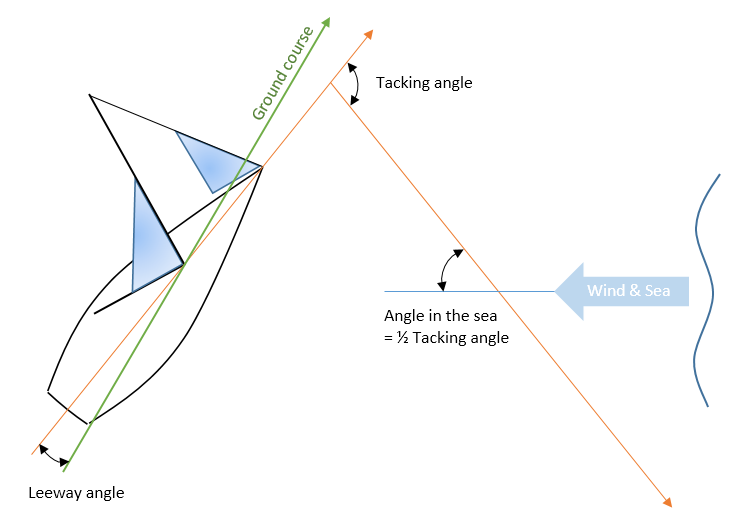 There are two aspects that are useful to dissociate and discuss separately when it comes to upwind performance: the tacking angle and the angle made good on the ground, in the absence of current. The course angle accounts for leeway, but the angle of the yacht in the sea is half of the tacking angle only. Ground course defines the ability to climb to weather, but the angle in the sea is what matters if the boat is caught in a breaking wave. Generally speaking, the tacking angle of a yacht in relation to the water (i.e. 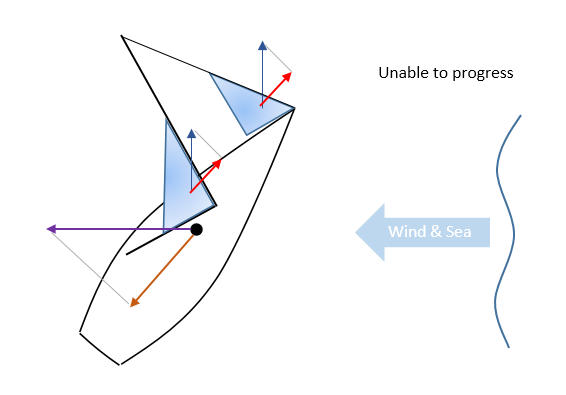 as read between compass headings, not in terms of ground course) is worst in very light winds and should first improve as the wind increases because the effect of the apparent wind is less prominent in the breeze than in light winds and the boat is less headed by its own speed-induced breeze. More importantly, it should then remain reasonably comparable all the way to the point where no canvas can be carried any more, allowance being made for sea state. If the tacking angle readily deteriorates as soon as the breeze picks up, the matter should be taken seriously. It is a sign that driving forces are not keeping up with drag as the wind increases and sea state worsens and the boat will likely become plainly dangerous in bad weather. The condition of the sails should be checked. Beyond this, windage should be reduced as much as possible. One should also look at hydrodynamic drag, such as large fixed propellers if relevant, but also anything else triggering turbulence on the hull surface, especially forward as this turbulence will then grow along the remaining length of the hull. The tacking angle controls the angle between the oncoming sea and the axis of the vessel. It is important in terms of ability to reduce risks in breaking seas and as a result it matters a great deal for offshore vessels. Anything over 100-110° quickly becomes extremely questionable. Headsail furlers are extremely detrimental to the tacking angle and cause catastrophic degradation in high winds if a partly rolled sail is used, because they ruin the aerodynamics of the sail from the leading edge. 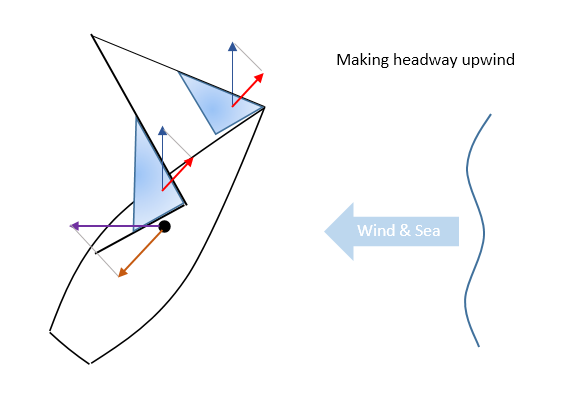 The ground course angle always deteriorates when the wind increases because larger sail forces need to be matched by a larger keel side force, which can only be achieved through a greater leeway angle once maximum speed has been reached. However, this difference only amounts to a few degrees with a decent keel configuration. Some yachts are simply too inefficient, exhibit too much overall resistance and don’t develop the aerodynamic lift force required to be able to climb to weather in a strong breeze. While this also comes with a poor tacking angle, a lack of draft or a poor keel configuration can result in high leeway angles while the boat still appears to be pointing reasonably. Appendage side forces are produced through a combination of angle of attack of the flow on the section and flow velocity. This means that one can trade leeway for speed and vice-versa, and while lift forces vary proportionally to leeway, they vary with the square of boat speed. The practical implication is that it may be better to allow the bow to fall off a little and sail faster than trying to point higher in circumstances where it is difficult to progress, as long as the angle of the boat in the sea is safe enough as mentioned in the previous paragraph. Sailing upwind in bad weather is a strategy that has been used by some ocean sailors since yachts have been able to achieve it. The early French circumnavigator Marcel Bardiaux, who was never much inclined towards losing time and ground at sea during his 1950-1958 single-handed voyage on board the cutter Les Quatre Vents, had adopted it quite unilaterally against accepted views at the time. Forereaching is a low-key concept that many very experienced sailors resort to today, which is essentially pointing into it upwind, but at low speed, something modern fin-keelers are usually very able to deliver under a single deep-reefed mainsail. It is more comfortable and easier on the gear than sailing at full speed upwind – which can be incredibly violent – as long as the conditions allow it. A yacht pointing into a breaking sea still needs enough momentum to cross the breaking crests without being thrown back, which would most likely have very unhealthy consequences for those on board. However, it would take a far bigger sea to achieve such a feat than what is needed to roll and completely disable a vessel lying in the troughs without speed. The longer and the faster the sea, the more powerful the breaking crests, the more forward momentum one is likely to need to deal with them. While my temperament often steered me towards simply punching into it, I occasionally resorted to forereaching with the sloop Yarra. One such instance was in the Southern Ocean while sailing from the bottom of New Zealand to Tasmania. Concerned about a westerly blow developing into much greater proportions, I had spent a night making limited progress under deep-reefed main just to see what was coming. In other circumstances, forereaching would have been out of the question due to the amount of expended energy present in the sea, but punching was a valid option. When the boat balances adequately, sailing a fin-keeler under a single small headsail can be very effective for punching in heavy weather, but usually too fast for forereaching. Hoisting a storm jib and dropping the deep-reefed main can be a very effective way of “changing gear” and gather momentum in very strong winds if the sea conditions call for it. The sloop Nordkyn, with its large mainsail and deep bulb keel, can achieve a broad range of speeds and angles upwind without headsail while maintaining perfect course control, from sailing very slow and very high to punching at speed. Sailing both very high and fast requires the use of a headsail. As usual, it is a matter of observation, assessment and decision at the time, at sea. It is also useful to assess what the boat can do whenever an opportunity arises. Storm force winds blowing off the land sometimes offer a useful testing ground for evaluating upwind performance and such conditions are quite commonly encountered when seeking an anchorage in high latitude areas. Can you describe Nordkyn’s foresail list and perhaps discuss how and when you use these sails? I wonder did you ever consider or use reefing jibs a la Moitessier? It has got a working genoa, a #1 jib, a #2 jib and a storm jib, all cut as tall blades. I reduce forward before reefing the main, it gives the best results. I have used reefing jibs on small boats many, many years ago and they worked ok. Here the bottom of the sail would be pretty stiff and heavy to gather up and I don’t think it would work too well. I was also going to make a maximum genoa, maybe out of Custom Axis Laminate, for the really light weather, but I have essentially dropped this idea. The working genoa reaches so far down in the wind range that there is no justification left. Then at the slightest increase in true wind speed upwind, the apparent wind augments so quickly that not wrecking that light sail would be an on-going concern. I have an asymmetric kite and a full kite. Initially, I thought the asymmetric would cover all my downwind needs by gybing between tacks. It doesn’t always work that way and I added a full spinnaker for the angles between 135deg and 180deg apparent. Spinnakers are fantastic light weather cruising sails. I crossed most of the South Atlantic under spinnakers and the longest I flew one without dropping it was 5 days and 5 nights, then I took it down ahead of a squall before putting it back up for another 2 days. Trying to play with a trysail (even more so short-handed) is first and foremost a good way to get yourself thrown overboard. Why would you attempt to hoist a crazy, unsupported piece of canvas trying to smash everything to pieces in a gale or worse, when you can deep-reef your fully-battened main that is already up without it even flapping once?! As long as you have a strong main and the reefing arrangements are bulletproof, the whole trysail concept is utterly senseless today. However, a strong main is heavy. Nordkyn’s mainsail weighs over 70kg. I pull it up to the second spreaders and then I have to winch the last 5-6 metres. If you start going lightweight, use high modulus fibres or try to roll the sail using some nonsensical contraption, chances are that it is not going to dependable in high winds. At that point people start talking about trysails again: well, cascading two bad choices doesn’t make a solution, unfortunately. And it keeps getting worse the more you look into it, because trysails are very poor at pointing the bow high and it is exactly what you want in bad weather. I can do that instantly with a deep-reefed main. So no trysail, ever. As the boat can sail at any wind angle under either of the two sails, it doesn’t even make any sense as a backup of sorts. I would rather carry a whole spare main as I did on the Yarra, this at least you end up using sooner or later! Very surprised to hear you are a spinnaker fan – many cruising folk seem to regard them as instruments of Satan! So, are yours full-size and lightweight as on a race boat or have you got a more robust and sensibly-sized set-up. And most important of all, how does Herr Forthmann’s self-steerer handle them? (I’m not seeking a product recommendation here but just like anchoring, there is a soviet of opinion out there about what works best and I would only expect you to comment as to how yours works on your boat). Spinnakers are some of the most essential cruising sails. They make all the difference between rolling around in the sea going nowhere, and tracking at a steady few knots on a stable boat. Mine are full-size of course – you need them when no other sail is working, not to “go faster” in good winds – and of moderate weight. They become too prone to damage and tearing if you make them ridiculously thin. One thing I regularly do in very light weather is replacing the sheet with a small, very light weight line, 3-4mm; the weight of the sheet can otherwise be enough to prevent them from taking their flying shape. You also need to understand kites to use them for cruising. Occasionally, downwind or on a broad reach, you can collapse it and then the boat catches up with it and it tries to wrap itself around the forestay. Momentarily gybing the main and flying the spinnaker “backwards”, filling from the leech, causes it to unwrap itself (with a little help from the foredeck if necessary) and you just recover, throw the mainsail back across and carry on. The Windpilot vane handles them fine, including in very light conditions, even downwind. It is a superb piece of engineering and I sailed about 60000NM on one without having to even look at the pendulum main bushings. Steering vanes don’t like large variations in apparent wind very much. The most challenging wind angle under spinnaker tends to be beam-reaching: the boat accelerates, bears away and then suddenly slows down, collapsing the kite. Preventing the slow-down, which is caused by over-steering, is the trick. At times, it can still go wrong now and then, but you just manage it. Alternatively, it overpowers the vane while accelerating, rounds up and then things get very noisy up there. There are quite a few things you can do with a Windpilot to change its sensitivity and response and, over time, you become quite skilled at setting it up. Most of the time, it is a no-brainer. If it gets challenging, the first thing you need to determine is whether the vane is over-steering or under-steering the boat. With kites on a beam reach, it is quite tricky because it can over-steer bearing away and then under-steer luffing back up. On the Yarra, which always had at least a little weather helm except dead downwind, the vane nearly always pulled the tiller to windward. The leeward steering line could be quite slack. Nordkyn is a very different beast. It is very light at the helm and requires more precise steering to keep its speed up. The vane needs to be able to luff it up quite readily and it requires as little play as possible in the steering lines. It also creates a lot more apparent wind and can be more challenging on the run, going from 11 knots to 18 knots and back down, but nothing that can’t be managed. I don’t carry any electric pilot at all. It could certainly be “useful” in some conditions, but I can’t see the point of having to put up with the cost, installation issues, reliability and maintenance aspects that come with it for virtually zero usage. If there really is no wind, I am happy to find something else to do and wait for it; if there is some, then I always manage to get the vane to steer somehow. The vane is the most important piece of equipment on board. It holds the boat 24/7 in all weathers, including when it is too dangerous to hang around outside. This in turn allows me to rest and look after everything else on board, because I am not needed at the helm, and I can keep doing this indefinitely.